My skin has always been one of my biggest issues when it comes to my body, so I'm always on the search for skincare product to help me improve it. 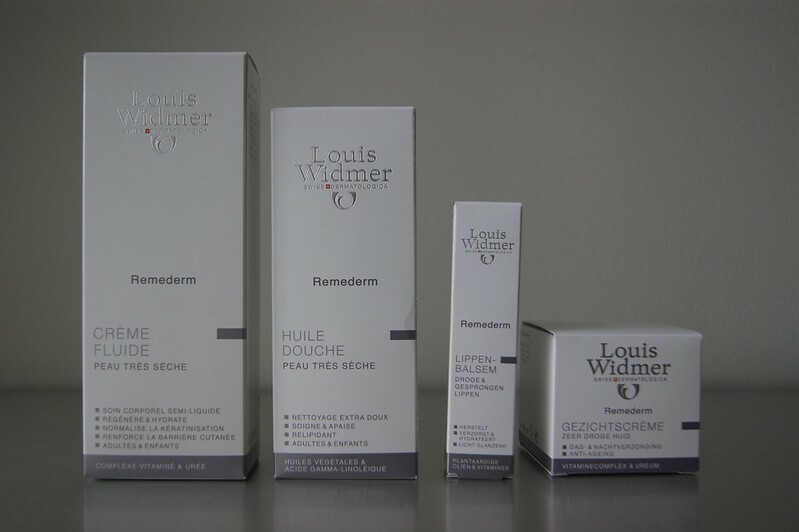 So, when New Pharma contacted me if I wanted to try some products from the Louis Widmer 'Remederm' Skincare Line, I was more than happy to accept. The 'Remederm' range has been developed for those dealing with dry skin, including myself. My legs, T-zone and arms (from time to time) have been dealing with dry skin for years. Louis Widmer was founded in Switzerland in 1960 by Louis-Edouard Widmer and his son Louis-Max Widmer. Even now, family members are actively working in the company to keep it running and to find ways on how to improve it. Louis-Max was even named 'Entrepreneur Of The Year' in 2003, so I think they are doing their job pretty well, to say the least. With "Living For The Skin" as their motto, the team at Louis Widmer is constantly on the search for the newest developments concerning the skin and everything related to it. For more information about the company's history, click here. I've been testing these products for about two weeks now and I've been seeing the positive results already, no joke. That's why I wanted to share my experiences ASAP. It's time to introduce you a new Belgian hotspot on the World Wide Web: Labelcrush.com! LabelCRUSH is an online platform where you can sell your preloved and good-as-new clothes, shoes, bags, jewelry -- well, you get the picture. However, this website is different from other vintage selling websites and shops. Why? - If you're interested in selling an item from your closet, you can decide the price you want to sell it for yourself. Plus, you can change the price whenever you want. It happens often that the owners of the vintage selling website or shop set the price your item will be sold for. 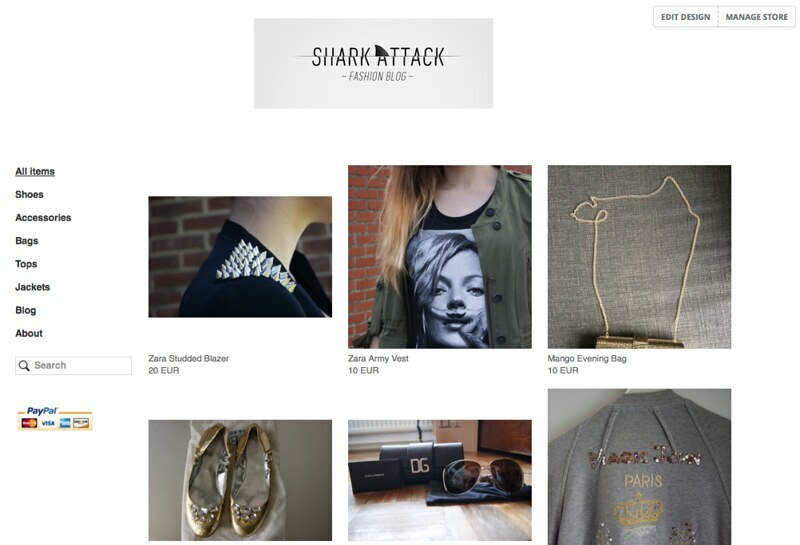 - The team behind LabelCRUSH don't get a penny if you sell an item. Most owners ask a commission whenever an item from their website or shop has been sold (a 20 % commission, for example). The only thing you have to pay for at LabelCRUSH, is to get your item online. These prices are nothing compared to the commission of a sold item; do you prefer to pay a couple of euros to advertise your item or to hand over 100 euros or more as a commission? Yes, I think so too. You can find all advertising prices here. I've been browsing the web shop for the past hour now and I've seen so many items I'd love to add to my wardrobe. Unfortunately, a lot of them are sold out already. You have to be very quick to get your hands on the item you want on the LabelCRUSH website. To avoid this from happening, you can become a VIP Member. This will give you the privilege to see and purchase all new arrivals 48 hours before the non VIP Members can. Pretty cool, right? Sold out or not, I decided to make a collage for you anyway. Nothing wrong with a bit of eye candy. My wallet isn't cutting me any slack at the moment, so I'm thinking of selling some of my designer items via LabelCRUSH myself. If I do, I'll let y'all know, of course! Finally a new 'Money VS Budget' post! What do you think about the mules' comeback? And if you own a pair, tell me: are they comfortable to walk in? * Get the Gianvito Rossi mules here. 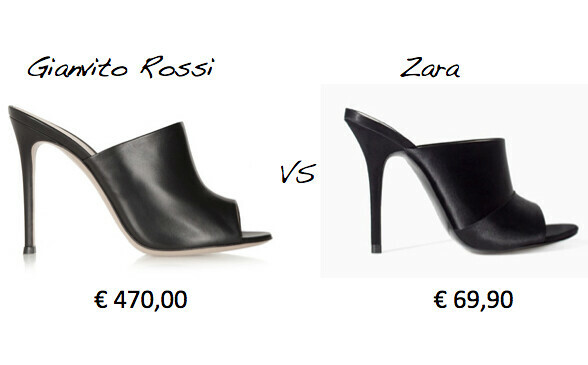 * Get the Zara mules here. I finally opened a Tictail account, on which you can shop items coming straight from my closet. I used to have a second blog on which I would sell my stuff, but I think Tictail is way more easier to use and less work to manage. To go to my online shop, click HERE. All information on how to order and pay items, you can find HERE. Spring and summer are slowly making their entrance in my closet lately. I spotted this powder pink hippie kinda dress at the Maje outlet shop at Maasmechelen Village, at 70 % off. #Score Yes, I know, this dress isn't something I'd usually wear, but so many combinations came to me when I saw it, that I just had to take it home with me. Just think about it... You can wear it with a big chunky belt, or without it. Combine it with tons of jewelry or go for the simple, delicate, ladylike bling. Wear it with sandals or ballerina flats. Or go for a pair of Minnetonka fringed boots or heavier ones à la Acne Pistol boots for that rock 'n roll touch. Let us not forget a pair of pumps to complete your party outfit. Add a fedora hat to it or put a crown of flowers in your hair to channel your inner Lana Del Rey / hippie. See? The options are endless, literally. Temperatures are finally rising here in Belgium, giving me the perfect opportunity to wear the Balmain jacket my dad got me during sales in January. I was doubting to wear it with a pair of black jeans - fearing that I'd look like a bumble bee - but I think it turned out pretty well. Besides that, I don't really have that much to say. For the last couple of days I've been working and enjoying the sun with my family and friends. That's about it! Last week, the ever so sweet people at UPR and Zalando invited me to discover their newest collection, an offspring from the collaboration between blogger / it-girl Eleonora Carisi and Zalando. I hadn't attended an event for ages, the first images looked very promising and I had to miss my blogger friends for way too long; the perfect mix to get me going. Most events take place an hour drive away from my home town, so it's not always practical nor easy for me to attend them. The event took place at Nomad in Antwerp. Time? 9 am. Auch! Getting up at 6 am wasn't an option (unless you want to meet some cranky b*tch), so I decided to crash at Michel and Bart's house the night place -- They're really good friends of mine and they live in Antwerp. Thanks again for the fun night, guys! Love you! Anyway, UPR and Zalando organized a healthy breakfast for us bloggers, at which we could enjoy the great food, the lovely collection and cosy scenery (read: huge plants and trees in a tiny location). 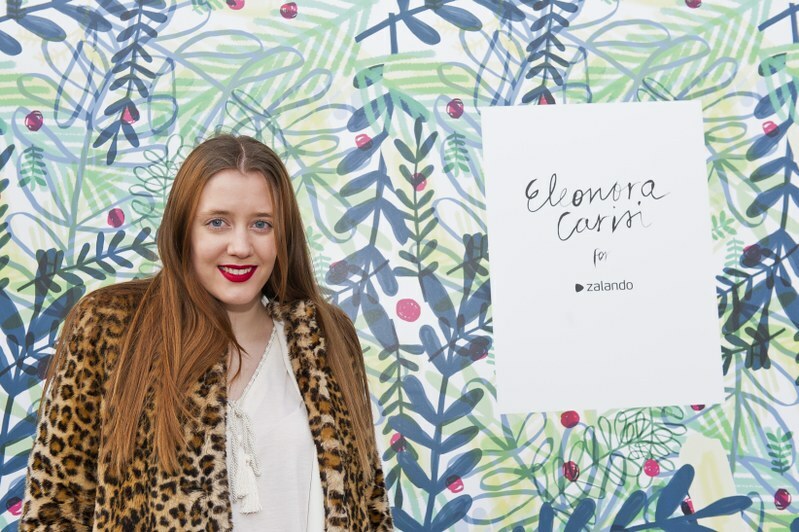 Eleonora Carisi is all about nature, which shows in the 9 piece collection she designed for Zalando: the print is a green leaves overload and the collection is made from silk, cotton and organza. You can check out the whole collection on Eleonora's own blog here. Cutting it short: I had a blast with my fellow bloggers, binged on all the delish food and really loved the collection, even though I always thought that I'd never like the color green. Thumbs up! The Eleonora Carisi For Zalando collection will be available from March (which is, like, now) and you can get it here. Please note that the collection is made from pretty things such as silk, cotton and organza, so the prices are adjusted to that fact. But remember: you get an eye catching statement piece in return! To see more pictures of the event, click below. All pictures are taken by Woodmonkey. They're black. They're made from leather. They were the last pair and in my size. I guess that you won't be surprised when I tell you that I used that last fact as an excuse à la "it was a sign from above" -- my mom agreed with me, my dad just rolled his eyes (but later admitted that he loves them as much as I do). 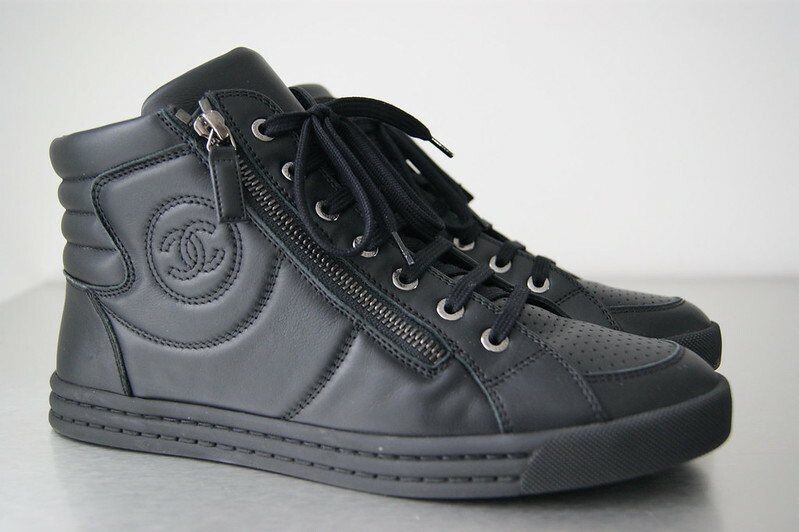 So meet my new babies, glued to my feet ever since I took them home with me from the Chanel store in Antwerp last week. Comfortable yet stylish, perfect to take every casual and everyday look to a higher level. Not to forget that there's only a subtle reference to the brand, always a plus.